VietNamNet Bridge - In the past, Mekong Delta residents, striving to produce as much rice as possible, built closed embankments to prevent floods and cultivate third crops. But now they need floods to preserve water to fight drought and saline intrusion. Le Anh Tuan, deputy head of the Climate Change Research Institute under Can Tho University, said it was necessary to reconsider third-crop rice cultivation. Tuan said many years ago, ensuring food security was the priority for the Mekong Delta. Therefore, farmers tried to cultivate three rice crops a year to increase productivity. In order to do this, they had to build embankments to prevent floods. However, things are now different. The soil is getting exhausted, while climate change has had impact on people’s lives and agricultural production. Countries on the Mekong River’s upper course are also taking away water for electricity generation. Instead of considering floods as a natural calamity, Mekong Delta should see them as natural resources which need to be taken advantage of to fight drought and saline intrusion. According to Nguyen Huu Thien, an independent environment expert, in 2001-2012, the area of three-crop rice in Mekong Delta increased by seven times to 470,000 hectares. Meanwhile, a report of the Ministry of Agriculture and Rural Development showed that the current area is 800,000 hectares. “Recovering the function of the two ‘water bags’ in Long Xuyen Quadrangle and Dong Thap Muoi must be the right decision,” Thien said. Prof Vo Tong Xuan, a leading rice expert, also said the soil in the Mekong Delta is getting poorer because of the policy on preventing floods for three-crop cultivation. According to Tuan, there are many ways to approach the issue. The Mekong River Commission plays a very important role in arranging water sources for the Delta. He said the expansion of embankment network must be stopped. It is necessary to remove dykes in the areas where rice cultivation is no longer effective. Tuan stressed that while removing embankments to receive floods, it is necessary to create favorable conditions for farmers in flooded areas. 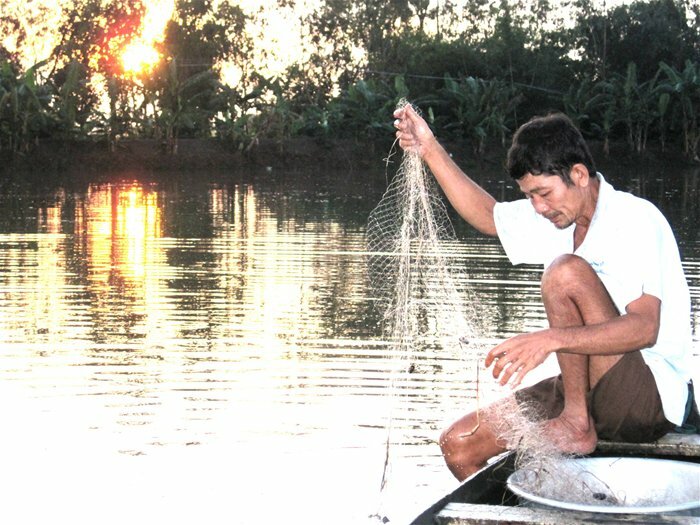 “Farmers can breed fish in flooding season in Tram Chim (Dong Thap) and Lang Sen (Long An),” he said. “The coastal provinces which get benefits from the water preservation, need to share profits with the farmers in flooded areas,” he added.